So you didn't get a permit for The Wave. Now what? ***WARNING: we do not, we repeat NOT, in any way shape or form, no how, no way, never in a million years, suggest that you attempt to hike to The Wave without a permit from the Bureau of Land Management (BLM)! Coyote Buttes North and South are regularly patrolled by BLM personnel, and you’d best believe they will check permits. Fines in excess of $1,000 per person and jail time can be imposed – and has been imposed – on those caught hiking in the area without them. So you didn’t get a permit for The Wave, either through the online lottery or the walk-in permit process? You’re not alone. But are you out of luck? Not necessarily. What we are suggesting for those with an indomitable determination to see The Wave, and for whom cost is not an obstacle, is to “break the surly bonds of Earth” and fly over it. So how would one go about chartering an aircraft over Coyote Buttes? First off, you’ll have a better chance of success by inquiring with an airport where air tours are already offered on a regular basis, such as Page, Grand Canyon, Sedona or Bryce Canyon. These facilities typically have air tour companies based on-field, some on a year-round basis, with aircraft and pilots available for charter flights. A basic Google search of air tour companies in your preferred city will usually yield the desired results. If not, simply call the FBO (Fixed Base Operator) at the airport you’re wanting to fly from and ask for the contact information for airplane or helicopter tour operators. 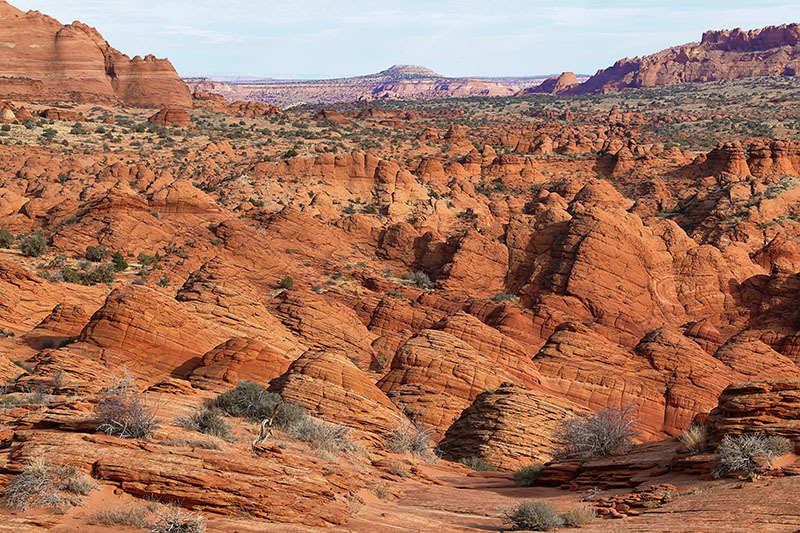 Since tour flights over the Paria Canyon/Vermilion Cliffs Area are not offered as a regular, scheduled service, you’ll want to ask specifically about doing a “charter by the hour.” Depending on where your flight originates from, timeframes will differ. To fly from the Page Municipal Airport (PGA) only over Coyote Buttes and The Wave, for example, would probably require less than 1 hour to cover. However, you might want to plan for more time since there are so many incredible sights besides The Wave, and you should definitely take advantage of the opportunity to see them. Contrary to what some may believe, present company (formerly) included, Coyote Buttes North and Coyote Buttes South are not no-fly zones. * Unlike the Grand Canyon, which is governed by Special Federal Aviation Regulation (SFAR), the airspace over the Paria Canyon/Vermilion Cliffs Wilderness Area is largely unregulated, which means it is possible to charter a fixed wing airplane or helicopter from one of several general aviation (GA) airports in the region. According to his website, “the flight took about 90 minutes, and it was a very impressive tour!” He provided the pilot with all GPS coordinates of the sights he wanted to cover, but most local tour pilots will be familiar with where these are located. At the time Mr. Kieckbush traveled, the flight cost $650 for 2 people aboard a 4-seat plane. Your costs will most likely differ depending on the size of your party, whether you prefer to fly in a plane or helicopter (helicopters are more expensive) and whether you wish to do a quick out and back over The Wave, or cover other areas as Mr. Kieckbusch did. Your final bill will usually be determined by “tach” (tachometer) time, meaning the time the the aircraft’s engine was actually running vs. chronological (“clock”) time. If you wish to customize your flight to include a landing and lunch stop at a local airstrip, your final cost will also include wait time, which is calculated by the hour. Buying lunch for your pilot, and a gratuity at the conclusion of your tour, are always appreciated. Due to the ecologically sensitive nature of the Coyote Buttes Special Management Area, and the fact that it’s a highly coveted hike, any charter flights over the area will most likely be limited to first thing in the morning. This is out of courtesy to the hiking community, who come here not only to experience the scenery, but to enjoy the quiet and solitude this remote area offers. This is also a practical consideration as afternoons in this part of the country tend to be quite windy, especially during the hot summer months when density altitudes can also pose a challenge to pilots. Be prepared to get to your chosen point of departure at first light, or not at all. Also, try to make your arrangements as far in advance as possible, especially if you’re flying with an established aerial sightseeing tour company. Schedule air tours are their “bread and butter,” and tours are often booked up weeks, sometimes months in advance. If that’s the case on your preferred flight date, they may not have the planes or pilots to spare for special charters. One last “caveat emptor:” if you follow the link above to Hiking-Southwest.de and take a look Mr. Kieckbusch’s photos, or this video by Tawagoto San on YouTube, you’ll probably see that The Wave doesn’t show up particularly well from the air. That’s because it’s a very small area in the context of the entirety of Coyote Buttes North. Also, you would not be able to land at The Wave or Coyote Buttes as there is no established airstrip or helipad there. But we think you’ll agree, the scenery you will experience without breaking a sweat is absolutely amazing and that by itself should be well worth the price of admission! This is not a comment but a question. I have attempted desperately to find a charter aircraft/helicopter to fly over the wave with no success. My problem is that I won’t be in the area until November/December and am coming from the other side of the world – Perth, Western Australia. Can you possibly locate someone for me? I am an author of travel books and want to include this unique destination. Sorry for the troubles in locating a charter company to fly you over The Wave. Hope that helps. If it doesn’t for some reason, please don’t hesitate to contact us again.